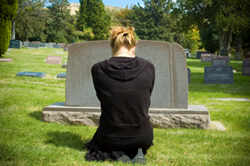 Brianne Overton tells Dr. Heidi Horsley at the 2015 Association for Death Education and Counseling conference that teens really don’t have a voice when it comes to grief. Since they’re in between children and adults, many adults think they’ll grieve similarly to their more mature peers, but that isn’t the case. Teens are in a demographic of their own and they do grieve differently. Plus, in the Digital Era, more and more teens look online for support and have developed their own methods (which is why the phrase “funeral selfie” is a reality). Adults might think teens aren’t grieving because they may not be outwardly emotional. Teenagers aren’t forgotten grievers, they do grieve, and they do have a voice says Overton. Dr. Horsley, who works with parents of teens who “should” be grieving, says that parents are often very concerned because their teen doesn’t grieve in front of them. Overton says some teens feel like they need to protect adults, or if it’s never been modeled for them how to grieve, they may not be comfortable expressing their grief or even know how. Modeling grief is the best thing an adult can do, but it’s tougher said than done. Exposing teens to an array of adults, including experts in the grieving field, can be a fantastic way to show them alternative grieving methods. Grief looks differently for everyone, and teens should know it doesn’t have to look a certain way. Art therapy, sports, writing, and more active ways of handling grief often speak closely to teens. Do sports with teens, urges Overton. If a teen is already on a sports team, encourage them to keep participating so they can help physically get out some emotions. Most importantly, be there and be open to communicating with teens if and when they choose.